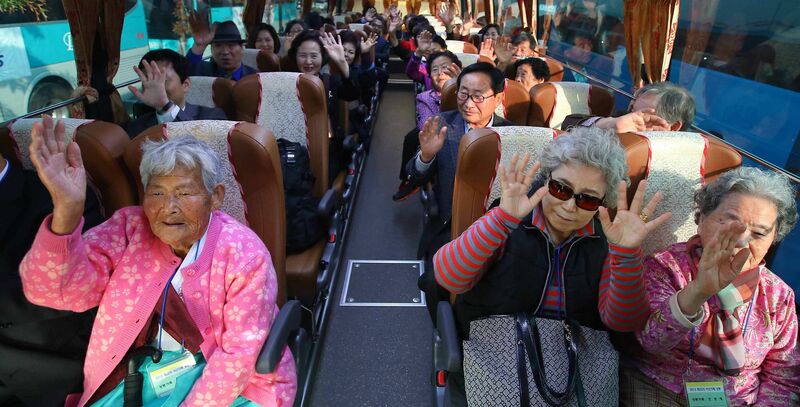 GOSEONG (South Korea) • Nearly 400 mostly elderly South Koreans, carrying gifts of warm clothes, cash and cosmetics, crossed into North Korea yesterday for a rare meeting with relatives they have either never met or last saw more than six decades ago. A fleet of buses led by four sedans flying Red Cross flags carried the family members from the port city of Sokcho to the heavily militarised border that has divided the peninsula - and its people - since the 1950-1953 Korean War. After passing through the high-security checkpoint at Goseong, they drove on to North Korea's Mount Kumgang resort, arriving around 1.30pm local time (12.30pm Singapore time) for the start of the three-day reunion. The reunion - only the second in the past five years - was organised as part of an agreement the Koreas reached in August to ease tensions that had pushed them to the brink of armed conflict. Millions were displaced by the sweep of the Korean War, which saw the frontline yo-yo from the south of the Korean peninsula to the northern border with China and back again. The chaos and devastation separated brothers and sisters, parents and children, and husbands and wives. With more than 65,000 South Koreans on the waiting list for a reunion spot, those headed for Mount Kumgang yesterday represented a very fortunate minority. "I couldn't sleep at all last night," said 82-year-old Lee Joo Kuk, sporting a tag that included his age and the name of the elder brother he will be meeting on Mount Kumgang. LEE JOO KUK, 82, who was on his way to see his elder brother. The family had thought all along that he was dead. "Our family was sure he was dead. We even held memorial rituals for him every year," Mr Lee said. "But then I got the news that he was alive and wanted to see us. It's like he's been resurrected." The reunion programme began in earnest after a historic North-South summit in 2000. Among the generation that experienced the division of their families, the vast majority died without ever having any contact with their relatives in the North. Because the Korean conflict concluded with an armistice rather than a peace treaty, the two Koreas remain at war technically and direct exchanges of letters or telephone calls are prohibited. The two ambulances following the South Korean buses yesterday testified to the advanced age and, in many cases, poor health of those making the journey. More than 20 people required the use of wheelchairs and one woman needed treatment and oxygen yesterday morning before boarding her bus. Four others dropped out of the trip altogether, saying they felt too unwell. Over the next three days, they will sit down with their North Korean relatives only six times. Each interaction lasts two hours - giving them just 12 hours to mitigate the trauma of more than six decades of separation. In a reflection of the stark economic divide, all the South Korean families had brought gift packages and - in most cases - several thousand US dollars in cash. South Korean officials had earlier warned that a substantial slice of any money handed over would be "appropriated" by the authorities in the North.